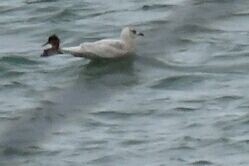 Immature and adult Iceland Gulls were reported on ebird at Ashbridge's Bay Park in Toronto. So yesterday I went to see if I could find one. With the help from two other birders, I finally sighted and photographed a juvenile Iceland Gull. The gull was in the water quite far away, so the photo is not great, but good enough to ID it. We can ID this gull as a juvenile Iceland Gull (Larus glaucoides) by its medium size, short all dark bill, overall grey-brown color, dark eye and spotting on the tertials (you can just make this out). The Iceland Gull breeds in the Arctic regions of Canada and Greenland, although not in Iceland, where it is only seen during the winter. It migrates for the winter to as far south as the the Northeast, Great Lakes and West Coast and British isles. The Iceland Gull is a new species to our Photographic Life List, which now stands at 777.